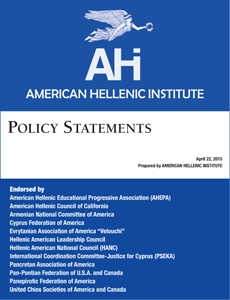 The American Hellenic Institute (AHI) announced the release of its updated Policy Statements for 2016. The policy statements discuss issues affecting the Greek American community as they pertain to United States relations with Greece, Cyprus, and Turkey. In addition, the statements include in its appendices AHI’s fact sheet detailing Greece’s contributions to United States interests in the eastern Mediterranean and to NATO and other resources, including full-length statements from government officials. 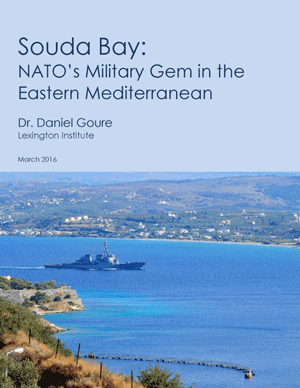 The American Hellenic Institute (AHI) and Lexington Institute, a nonprofit public-policy research organization, co-hosted a presentation on Capitol Hill to announce the release of a Lexington Institute white paper, “Souda Bay: NATO’s Military Gem in the Eastern Mediterranean,” March 21, 2016, Rayburn House Office Building. The presentation featured the white paper’s author, Dr. Daniel Goure, vice president, Lexington Institute; and Greece’s Minister of Defense, Panos Kammenos. AHI President Nick Larigakis moderated. The American Hellenic Institute (AHI) welcomes a monograph published by the Hudson Institute titled, “U.S. Policy and the Strategic Relationship of Greece, Cyprus, and Israel: Power Shifts in the Eastern Mediterranean” by Seth Cropsey, director, Center for American Seapower. The monograph is the culmination of Hudson Institute’s work on a project centered on research conducted for the past year and a half about security in the eastern Mediterranean, specifically energy security.